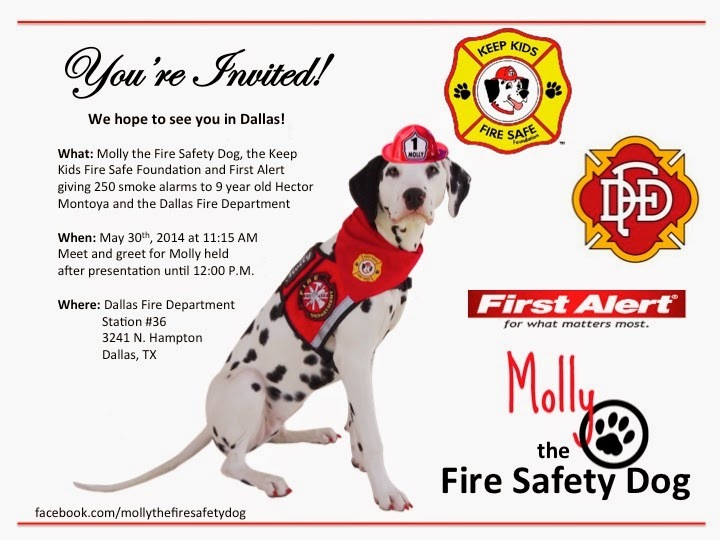 Fire Safety Rocks: Molly the Fire Safety Dog Headed to Dallas! Instead of buying himself something for his birthday, Hector wanted to buy smoke alarms to help keep children in his area safe. Tomorrow we leave for Dallas to see Hector, and we are so very excited! These are the events that we have planned with Hector. What is super cool about all of this, is that Hector wanted us to visit two schools to share our fire safety program. Guess what? Hector is going to help too! 401 East Grand Prairie Rd. 11:15 AM Presentation of smoke alarms to Hector and the Dallas Fire Department on behalf of First Alert and the Keep Kids Fire Safe Foundation. Department's Station 36 for a meet and greet until noon! Woot, woot! We hope you can come! Special thanks to First Alert for providing 250 smoke alarms and the Dallas Fire-Rescue Department for allowing the Keep Kids Fire Safe Foundation the opportunity to come to their station. But most of all, we would like to thank HECTOR, for helping keep kids safe! You rock!